Which of the three is most deserving of your dough? Money tested them to help you pick one you won't be able to put down. The new kid on the block is the winner. Besides having the biggest bookstore (from which you can download wirelessly), the Nook has the best access to all kinds of content. It can display the EPUB format (so you can read titles from your public library and from Google) as well as PDFs, photos, and MP3 audio files. 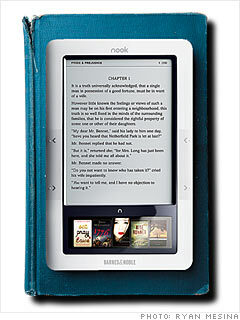 Its screen makes reading easy. And navigating is a cinch, thanks to the LCD touchscreen along the bottom.